In November, during a 4 week visit to Timor-Leste, Derarca O’Mahony (National Convenor, AusTimorFN) met with Sr João Mártires to discuss his role as the new Timor-Leste Facilitator for AusTimorFN. 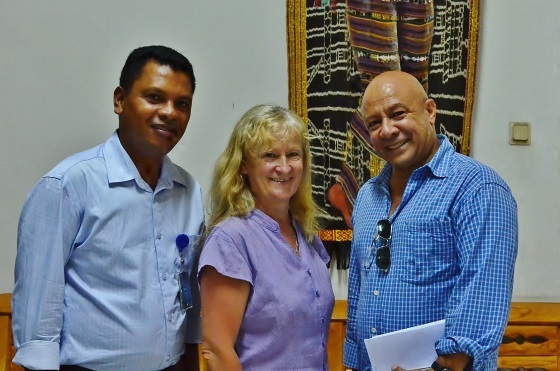 Sr João Mártires’ strong connections with Australia and his multi-linguistic skills (fluent Tetun, English and Portuguese) will be a great asset for AusTimorFN’s communication with Timor-Leste. Derarca and Sr João Mártires arranged a meeting with Sr Afonso Candido, Advisor at the Ministry of State Administration to formally introduce Sr João Mártires. Sr Afonso Candido has replaced Sra Margarida Bosco as the liaison person at State Administration for the Friendship groups. Derarca also wanted to personally thank Sr Afonso Candido for his prompt support to the two Friendship groups who encountered problems prior to the Melbourne Conference in July in regard to the Timorese guests they were bringing out to Melbourne. Sr Afonso Candido had acted diligently in providing assistance so that the Timorese were able to attend the Conference as planned. Sr Afonso Candido gave an update on the Pre-deconcentration Municipal Process, confirming that Aileu, Liquica and Ermera will be the three districts to pilot the process. In January 2015 the process for appointing the new Managers of these three districts will commence as approved by the Council of Ministers. After that each Ministry will appoint staff to work under the Manager in each of the districts. The proposed new administrative structure within the sub-districts can be viewed here. Friendship Liaison contact details can be found here.